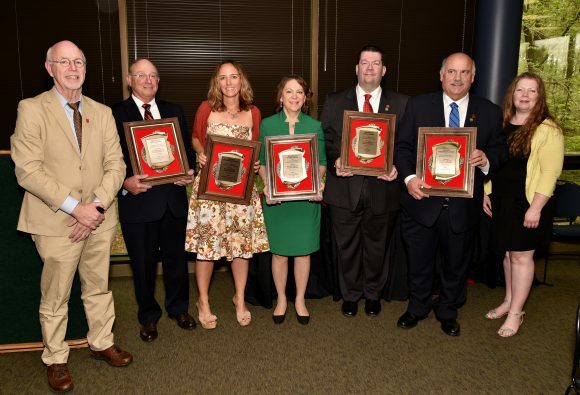 Share the post "Alumni are Honored with George H. Cook and Dennis M. Fenton Awards"
Cook Alumni Committee co-chairs with George H. Cook and Dennis M. Fenton Award winners. (L to R) Mark Gregory Robson (Cook’77), professor, Department of Plant Biology and co-chair Cook Alumni Committee; Michael Hlubik (CAES’70); Ann Marie Grover Carlton (ENG’95, GSNB’99,’06); Kerry Kirk Pfulgh (CC’80); Marc Kollar (CC’95); Gregory DiLalo (CC’77, GSNB’79); Margaret O’Donnell (CC ’93), program manager, Rutgers Business School Executive Education and co-chair Cook Alumni Committee. Alumni, friends, and family gathered to honor six graduates selected by the Cook Community Alumni Association (CCAA) for their career accomplishments, community service, and leadership. The ceremony was held on April 30, 2017. 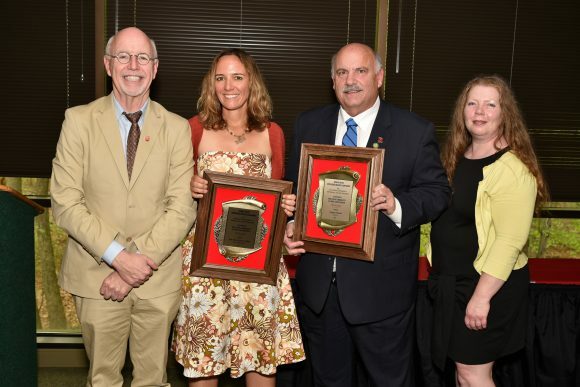 Undergraduate alumni receiving the George Hammell Cook Distinguished Alumni Award were Michael Hlubik CAES’70; Kerry Kirk Pflugh CC’80; and Marc Kollar CC’95, freelance media and communications consultant and current president of the CCAA. Honored with the Dennis M. Fenton Distinguished Graduate Alumni Award were Ann Marie Grover Carlton ENG’95,GSNB ’99, ’06; Gregory DiLalo CC’77, GSNB ’79; and Apostolos Pappas GSNB ’99. 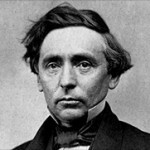 The award, established in 1976, commemorates the life of George Hammell Cook (1818 – 1889) whose efforts helped to bring Land Grant College status to Rutgers and to create the New Jersey Agricultural Experiment Station. Dr. Cook’s inquisitive and results-oriented spirit remains active in the ideals embodied by the Cook community which includes the School of Environmental and Biological Sciences (SEBS) and the George H. Cook campus. This award is presented annually to an alumnus or to alumni whose outstanding accomplishments in professional or volunteer work reflects dignity and distinction on their alma mater. The Cook Award is the highest honor presented by the Cook Community Alumni Association to undergraduate alumni. Eligible alumni are those who earned an undergraduate degree from the School of Environmental & Biological Sciences, Cook College, C.A.E.S., the Rutgers College of Agriculture or alumnae of Douglass College or N.J.C. who earned a degree in agriculture or a related field. 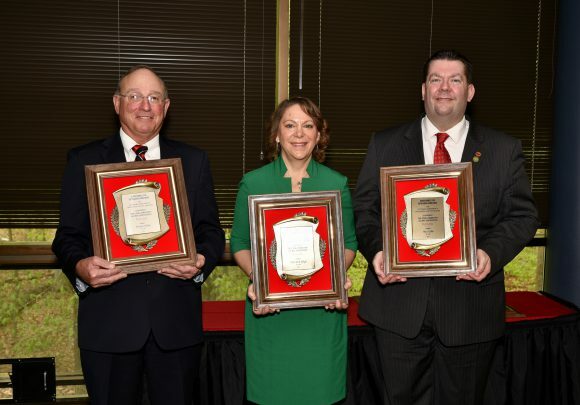 George H. Cook Award winners Michael Hlubik (CAES’70); Kerry Kirk Pfulgh (CC’80); Marc Kollar (CC’95). Mike Hlubik had an outstanding career of 42 years as a Teacher of Agriculture at Northern Burlington High School. He was active in many professional teaching and agricultural societies and programs. He was an active member of his township, serving as a committeeman for 15 years. Mike served as the mayor for four years and 6 years as deputy mayor. Mike served on the Chesterfield planning board for 17 years. Mike has freely given of his time and energy to Rutgers and Cook causes. He is a very humble and giving individual with a long list of professional and personal accomplishments. Most importantly are his constant efforts to recruit bright young men and women into agriculture and to steer them to SEBS (COOK) for their education. Kerry has spent most of her career at the New Jersey Department of Environmental Protection (NJDEP). She has been a leader at the DEP in the area of risk communications as she managed the sharing of information to the public and to the scientific community. Nominated by Dr. Roger Locandro and Dr. Bonnie McCay, they both describe her as a true leader in the field of environmental education and outreach to New Jersey’s stakeholders on a host of environmental issues. Kerry has worked closely with the faculty at the School of Environmental and Biological Sciences (SEBS) to promote faculty research among the environmental community. She has also provided leadership and support to both recreational and commercial fishermen and at the community level on health and environmental issues. Currently, she is the liaison to all 565 New Jersey Mayors and 21 County Administrators advocating for them and ensuring they have a voice in environmental matters that affect their towns and counties. Kerry enjoys Kayaking and spending time with her family. Marc is a tireless supporter of the COOK CAES Alumni Association and currently serves as the Association President. He devotes countless hours to the work of the COOK CAES as well as to the Rutgers Alumni Association (RAA). He currently works as a freelance media and communications specialist with a number of clients in Central NJ. His goals for the Association have included moving the COOK CAES alumni group toward closer alignment with the RAA and therefore, incorporation into the university-wide strategy for supporting Rutgers through alumni activities. He has also supported the expansion of the young alumni group and the Life after Graduation program. Marc has been active on Ag Field Day, planning and preparing for alumni events, and at athletic functions such as Rutgers Football games, and also most recently promoting the support of the Cook’s Market at the Rutgers Gardens. Eligible alumni are graduates of Rutgers University’s Graduate School of New Brunswick who earned a Masters or Doctoral degree from a program or department currently or historically associated with the School of Environmental and Biological Sciences, Cook College, the College of Agriculture and Environmental Science or the Rutgers College of Agriculture. Mark Gregory Robson, co-chair Cook Alumni Committee with Dennis M. Fenton Award winners Ann Marie Grover Carlton (ENG’95, GSNB’99,’06); Gregory DiLalo (CC’77, GSNB’79); and Margaret O’Donnell (Cook’93), co-chair Cook Alumni Committee. (Missing Fenton Award winner Apostolos Pappas (GSNB’99). Dr. Carlton recently took a very exciting Associate Professor position at UC-Irvine. Prior to that, she was a scientist at U.S.EPA and here at Rutgers. Her past awards include: Rutgers University Board of Trustees Research Fellowship for Scholarly Excellence 2016, U.S.EPA –Science Advisory Board: Level II Science and Technology Achievement Award 2012, American Association of Women Geoscientists (AWG) – Distinguished Lecturer 2011 and 2012, U.S.EPA National Honor Award (Bronze Medal) for CMAQ Model 2010, U.S.EPA-National Exposure Research Laboratory, Special Achievement in Atmospheric Chemistry 2010, Distinguished Alumnus (early career) Rutgers University 2009, U.S.EPA-ORD National Honor Award for CMAQ Development 2009, U.S.EPA National Honor Award (Gold Medal) for Air Quality Forecasting 2009, Emerging scientist award: Gordon Conference on Biogenics and the Atmosphere 2007, and Atmospheric Chemistry Colloquium for Emerging Senior Scientists (ACCESS VIII) 2005. Greg has been a very strong supporter of all things on the G H Cook Campus; he works tirelessly and quietly to make certain the IT infrastructure at SEBS and NJAES functions properly. He is always very willing to assist the Cook CAES Alumni group and is a very loyal and dedicated alumnus. 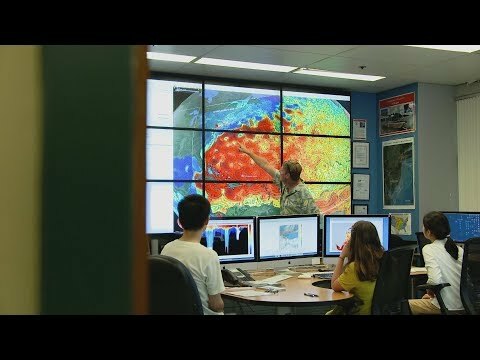 Greg works for Rutgers University School of Environmental and Biological Sciences / NJ Agricultural Experiment Station as the Director of Information Technology (1991-Present) and is responsible for all short and long range information technology planning. Greg addresses IT policy issues, application development needs, administrative systems operations, scientific and disciplinary specific computation, data transmission, transformation, and storage requirements. He analyzes and plans for all on-campus and remote station Internet and computing needs, directs the work and operations of the Information Technology Services unit, and serves on key university advisory councils including: the University CIO Leadership Council, collaborative applications and architectures committees, technology standardization and procurement committees, emergency preparedness, and university human resource classification committee. 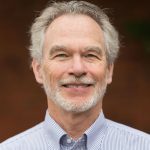 Greg serves as the chief technical advisor to the Executive Dean and the Dean’s Leadership Team. Apostolos Pappas, Ph.D., started his professional career as a research biochemist in the Skin Research Center of Johnson & Johnson in 1999 and later, in 2001, served as a group leader at Munich Biotech, where he worked on cancer research. Thereafter, in 2003, he returned to Johnson & Johnson, where he is currently a Research Manager and Fellow focusing on lipid metabolism research. Dr. Pappas is one of the first to culture cells that were previously not cultured; as human primary sebocytes and more recently human facial preadipocytes. He has authored forty peer-reviewed scientific publications, patent applications, and four books. While at J&J, he collaborated with many experts and KOLs to open a new field within the academic textbooks arena and curriculum on “Nutrition and Skin,” which was published by Springer in 2011. The success and wide recognition of this project paved the way for his second academic textbook by Springer in 2014, Lipids and Skin Health, which was the very first of its kind as well. He initiated and chaired three major symposia and has given more than 20 invited lectures at prestigious societies and universities. In September 2013, Apostolos became a member of the Rutgers Center for Lipid Research and adjunct faculty for the Department of Food Science at Rutgers University teaching: “Nutrition and Skin,” “Food and Health,” and “Nutraceuticals, Functional Foods, and Dietary supplements,” as well as the “Lipid Chemistry” lecture for the “Introduction to Food Science” course.